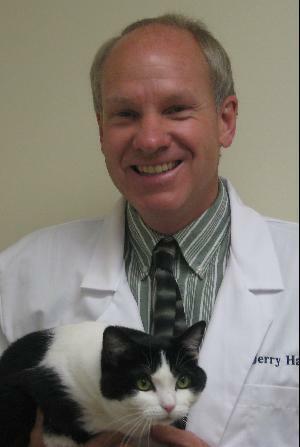 Dr. Jerry Hans is a 1985 graduate of Purdue University where he won awards for highest grade point average and for clinical proficiency in small animal medicine and surgery. He spent a year doing advanced training at the University of Minnesota (less than 5% of veterinarians receive this level of training). He is a native of New Carlisle and is married with 3 children (his oldest is currently resident at a specialty center in Columbus Ohio to become a board certified veterinary surgeon.... it runs in the family!). His principle hobby is training and showing standard poodles for both conformation and obedience. He is a past-president of the Michiana Veterinary Medical Association and he is also a member of the American VMA, the Indiana VMA, the American Animal Hospital Association, and the American Association of Feline Practitioners. He is also an affiliate veterinarian with International Canine Genetics, which provides advanced training in canine reproduction.